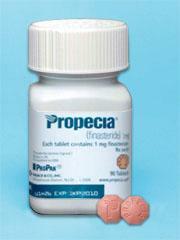 PROPECIA is a pill used for the treatment of male pattern hair loss. Before taking this medication, tell your doctor if you have liver disease. You may not be able to take Propecia, or you may need a lower dose or special monitoring during treatment. Propecia is intended for men use only. Propecia is not indicated for women use. Do not take or handle this medication if you are pregnant or are could become pregnant during treatment. Propecia is in the FDA pregnancy category X. This means that it is known to cause birth defects in an unborn baby. Women who are or who may become pregnant must not handle crushed or broken Propecia tablets. The medication could be absorbed through the skin. Propecia is known to cause birth defects in a developing male baby. Exposure to whole tablets should be avoided whenever possible however exposure to whole tablets is not expected to be harmful as long as the tablets are not swallowed. It is not known whether Propecia passes into breast milk. Propecia is not intended for women use. Do not take this medication if you are breast-feeding a baby. If you miss a dose of Propecia and you remember the same day, take it as soon as possible. If you do not remember until the next day, skip the missed dose and go back to your regular dosing schedule. Do not take 2 doses at once. Stop taking Propecia and seek emergency medical attention if you experience an allergic reaction (difficulty breathing; closing of the throat; swelling of the lips, tongue, or face; or hives). Store Propecia at room temperature between 59 and 86 degrees F (15 and 30 degrees C) in a tightly closed container, away from moisture. Seek emergency medical attention if an overdose is suspected. Symptoms of a Propecia overdose are not known. DO NOT share Propecia with others for whom it was not prescribed. DO NOT use Propecia for other health conditions. Keep this product out of the reach of children. If using Propecia for an extended period of time, obtain refills before your supply runs out.